The Fuller’s Board of Directors comprises a balance of skills, experience, independence and knowledge – containing a mix of individuals with the ability to respond to the challenges of a continually changing business environment. Aged 58. Joined the Company in 1984. Appointed a Divisional Director in 1992 and to the Board in December 2009 with responsibility initially for sales then, additionally, personnel. Now responsible for Corporate Affairs and government relations. A GMP graduate of Harvard Business School. Aged 47. Appointed to the Board in 2012. 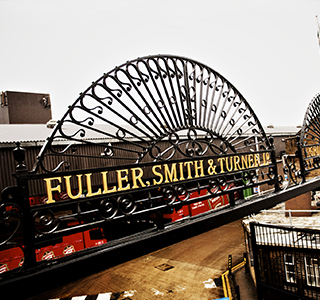 Joined the Company in 2005 and appointed as Operations Director for Fuller’s Inns in 2007. Has previously held positions at Carlton Communications and Molson Coors. An arts graduate with a master’s degree in marketing and alumnus of Columbia Business School. Aged 43. Appointed in 2016. Joined the Company in 2015 as Operations Director for Fuller’s Inns – Premium City. Previously COO of The Orchid Group, and has held positions at nPower, The Yates Group, Mitchell & Butlers and Scottish & Newcastle. A retail marketing graduate. Aged 48. Appointed in 2014 after nearly ten years as Group Company Secretary of Eurotunnel. Previously worked as a solicitor in private practice and then as Company Secretary to various UK and international companies. Aged 65. Appointed in 2018. Non-Executive Director and Chair of the Compensation and Governance Committee of Express Inc (USA), a publicly listed company. Non-Executive Director of Driven Brands USA, a private company. Chairman of the Wales Millennium Centre. Former President and Chief Executive Officer of Molson Coors Brewing Company and former Non-Executive Director and member of the Audit Committee and Compensation Committee of Cabela’s Inc (USA). Aged 59. Appointed in 2009. Independent Non-Executive Director. Non-Executive Deputy Chairman of Genius Foods Ltd., Senior Advisor to Inverleith LLP and Non-Executive Chairman of Chapel Down Group plc. Director of The Edinburgh Beer Factory Limited. Former Chief Executive of C&C Group plc and former Chief Executive of Scottish & Newcastle plc prior to its takeover by Heineken and Carlsberg in 2008. Former CEO of The Hothouse Investment Club. Aged 47. Appointed in 2010. Served in The Life Guards 1991-1998. Employed by the Company from 1998-2003, working in the Tied and Managed Pub estate and has since been running his own business. Aged 48. Appointed in 2018. Chief Executive of Mabey Holdings Limited. Previously Chief Financial Officer of Mabey Holdings Limited. Former Chief Operating Officer (UK and Europe) and Finance Director (Commercial UK) of Savills plc. A Geography graduate qualified as a Chartered Accountant with Ernst & Young. Aged 60. Appointed in 2019. Independent Non-Executive Director. Non-Executive Director of international fast-dining restaurant group Vapiano SE and motor accessories and cycling giant Halfords Group plc, where she chairs the CSR Committee. Formerly Group Executive Director at Caffé Nero and Managing Director of Zizzi, the Italian casual dining chain. Vice-chairman of the Ben & Jerry’s Board.